Just cause it is hot doesn’t mean I can’t bake a pie. Ran my exhaust fan to carry off some of the excess heat. Worth it for the yummy pie to share with friends and family. I was out of town and missed sour cherry season in late June. Bummer. 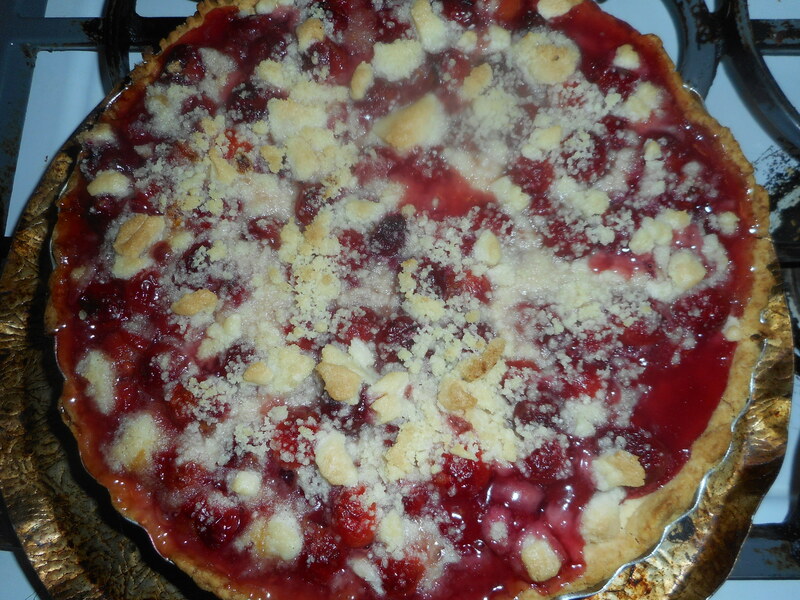 So…cherry pie; want it but didn’t want canned pie filling. No sour cherries in the farm stand, no frozen ones in my grocery store. What to do. I decided to make a cherry berry pie with a four berry blend from the grocery store’s frozen case. I have used this blend before to make muffins and it did pretty well. One other options is jarred sour cherries, maybe next cherry pie attempt will be with them. If you prefer a lattice it can be made by doubling this pie crust and some careful construction work. I tend to go the easy route of the crumb as everyone loves it. You could make a smaller 8 inch pie; use a cup less fruit and cut the sugar some, ditto for the tapioca. This pie is fantastic with a scoop of vanilla ice cream on the side. This recipe is a blending of my own pie filling and the pie crust and crumb recipes from Annalise Robert’s cookbook, Gluten-Free Baking Classics. 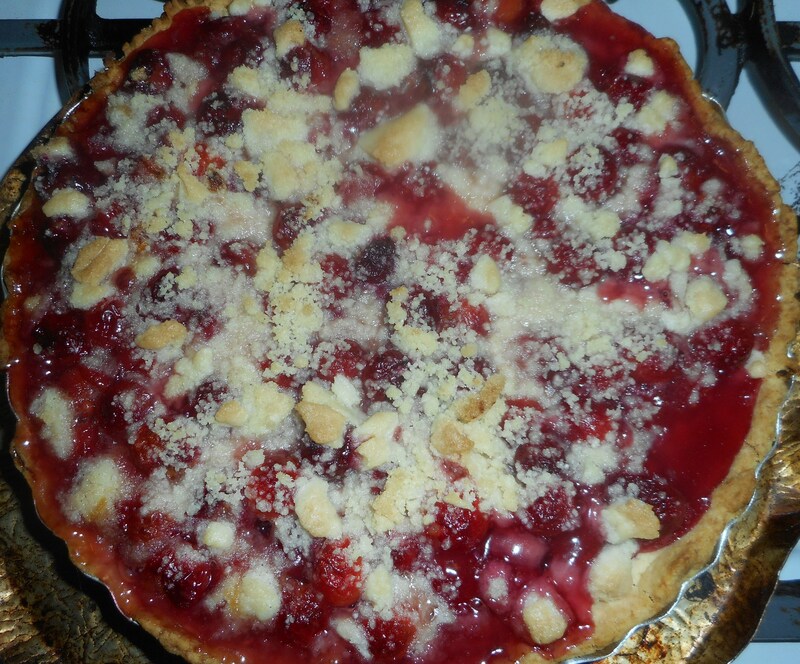 I used a touch less sugar a a bit more fruit, and the frozen fruit blend to create my own special pie. That cookbook is a fabulous resource and I can’t recommend it enough to anyone trying to bake gluten free for a family member. There is nothing like the classic dessert of a pie to comfort a celiac who can’t eat what they used to. Mix dry ingredients in bowl of stand electric mixer. Add butter and mix until crumbly and resembling coarse meal. Add egg and juice. Mix until it comes together into big chunks. Shape into a ball with your hands. Put it on a crust sized piece of wax paper (14 x 14 inches more or less), flatten the crust ball some; put on top of it another piece of wax paper and chill it all in your fridge 15-20 minutes while you ready the crumb crust and the fruit. Bake in a preheated 400 degree oven for 30 minutes with a piece of aluminum foil on top of the pie, then 25-30 more minutes at 375 degrees uncovered until bubbly and the crust is light brown. If you use frozen berries like I did, don’t defrost them more than half way; make sure it is bubbling and light brown before taking it out of the oven. Cool at least 2 hours before serving at room temperature. Pie is a classic American dessert, what guy doesn’t like a fat slice of juicy pie? Cherry pie is perfect for the weeks before and after the Fourth of July or anytime you can get frozen sour cherries. Like this past weekend for a belated President’s Day pie. My sister sometimes uses jarred cherries but I prefer fresh or frozen sours. You can make it gf easily with this recipe – my crust is really tasty; my family practically cheers when I serve homemade pie and the rest of my family does not eat gluten free. Fresh tasting, locally sourced fruits are exactly in the spirit of summer. I picked mine this past July at an orchard down in Bucks County near the Turnpike along Limekiln Pike, about 20 minutes from Hellertown. Froze some of my pickings and here they are in this yummy treat; like a taste of high summer. The sugar, cinnamon and almond extract create an intense cherry flavor but it will still be very cherry without the extract; left it out in the pie I made Saturday. If you prefer a lattice it can be made by doubling this pie crust and some careful construction work. I tend to go the easy route of the crumb as everyone loves it. You could make a smaller 8 inch pie; use a cup less fruit and cut the sugar some, ditto for the tapioca. This pie is fantastic with a scoop of vanilla ice cream on the side. It is also yummy with some good quality plain organic yogurt, really! Very healthy, tasty and no guilt with this treat. Mix the following in a small bowl and pour over the cherries. I used my frozen fruit and poured the following right into the bag and squished it around a bit before pouring into the pie crust. 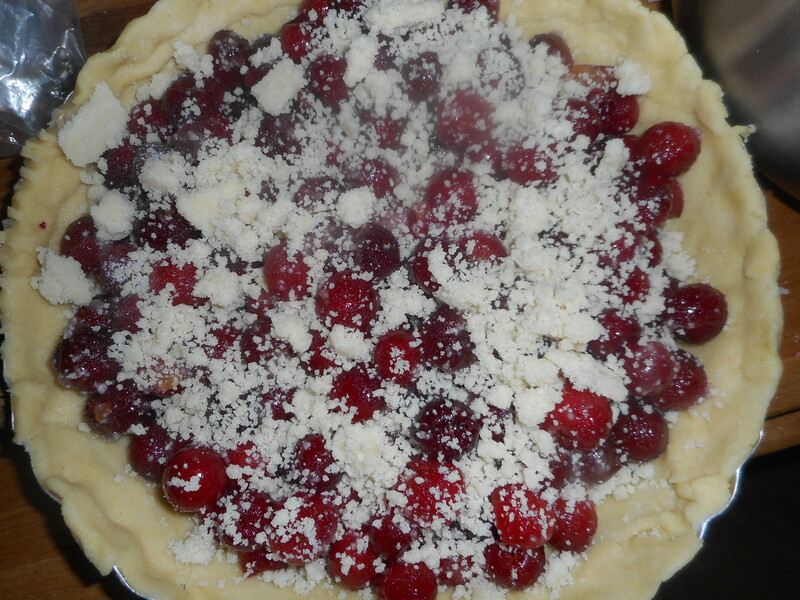 Bake in a preheated 400 degree oven for 30 minutes with a piece of aluminum foil on top of the pie, then 20 more minutes uncovered until bubbly and the crust is light brown, longer if you are using frozen fruit. Cool at least 2 hours before serving at room temperature. Put all four ingredients in the same mixing bowl you made the bottom crust in and mix well with mixer paddle until crumbs form. Don’t over mix or you will get a soft dough; not a good thing…done it and not happy with myself…still usable; just big crumbs. Originally posted by me here in July 2015. Minor revisions made. 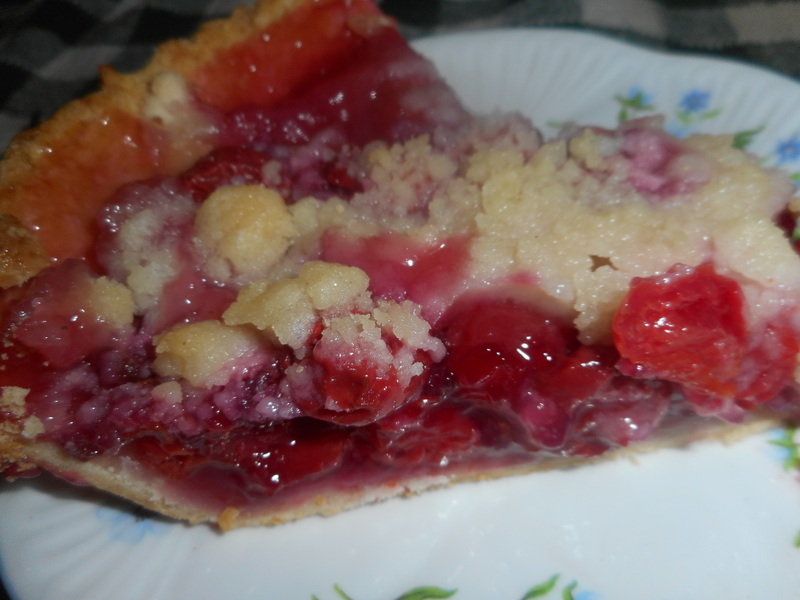 Cherry Frangipane Tart – Cherrylishous! Cherries are a Drake family favorite. I have one sister who seems to live on sweet cherries all summer long. I love them myself; a bowl of sweet and tangy cherries for dessert is the best! 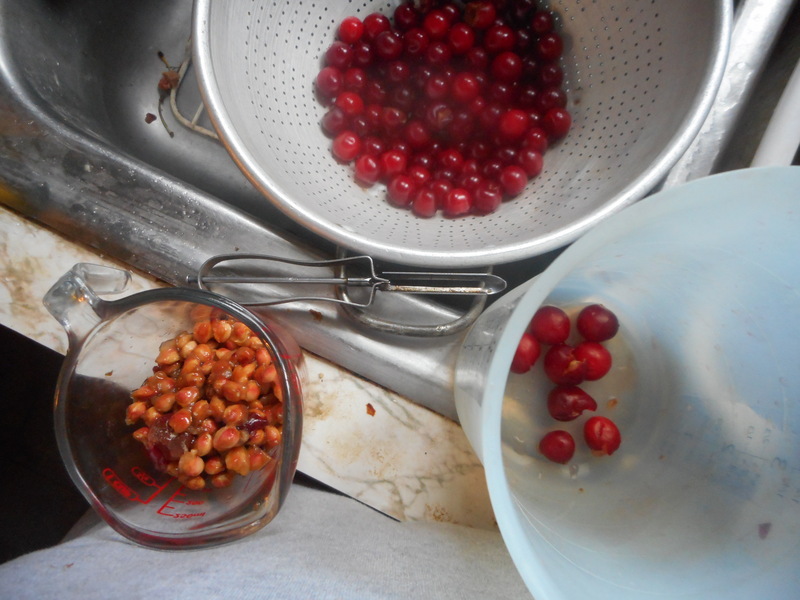 Once I made a whole dinner with cherries of one form or another in every recipe. Rave reviews from everyone. Pies should be made with sour not sweet cherries. Not sure why, cause you gotta add sugar anyway but it is the way of the cherry. I love sour cherry pie…but, I never ate cherry pie as a kid because I couldn’t trust my mom to pick out any worms she saw in the home grown cherries she used for pies. So I cheated myself out of many slices of delicious cherry pie. This past summer I picked a lot of sour cherries and pitted them all. One pie for now and the rest measured and frozen. No worms, I promise! The recipe comes from my new bestie gf baking book; Gluten-Free Baking Classics The Heirloom Collection by Annalise Roberts. I didn’t change it at all. Perfection with cherries. I am telling you, this cookbook is worth buying just for the pie section! Spray 9 inch metal tart pan (with removable bottom) with cooking spray, dust with white rice flour. I actually used a ten inch ceramic tart pan; worked fine too. Use the tart pan you have. Roll out pie crust between the two sheets of wax paper; try to get the thickness even, no thick middle! My sister Karen gave me a pie bag last year and I love it for an even thin crust. You can get one on line from King Arthur Flours. Peel off one side of paper and place in pie pan, centered. Remove other slice of wax paper. Crimp edges all around. Bake 15 minutes at 375 degrees, cool before filing. Crust can’t be hot or the almond and butter filling will melt when you spread it over the crust! Beat butter and sugar in bowl of large mixer until pale and fluffy. Add egg and other ingredients except cherries; beat it all together with a mixer at low speed until well blended. Bake in a preheated 375 degree oven for 40-50 minutes, until tart is puffed and light brown across the whole surface. Take out of the oven and cool at least 1 hour before removing the side ring. Serve warm or close to room temperature. Note: if you use frozen cherries; measure and weigh frozen. Let them defrost, pat off excess moisture and spread them over the filling.